The audience determines how your work is received and evaluated. Similar to perspective in photography, it is impossible to be neutral in this regard. You must decide the audience you wish to address to have any idea what successful communication would look like. This is true because the knowledge an audience already possesses will constrain how you can communicate and shape how they will interpret your work. 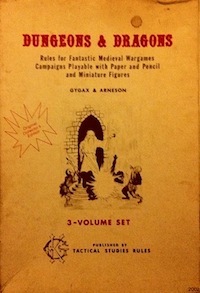 Some obvious examples include jargon (hit points, tactical infinity, carousing), cultural landmarks (orc, cosmic alignment, tiefling), intended use (self-contained game versus supplement), and received wisdom (XP for GP incentivizes creativity, XP for GP is unrealistic, extensive prep leads to deep fictional worlds, extensive prep is the sign of a wannabe novelist). Jargon can be redefined, new landmarks introduced, and received wisdom challenged, but only if you have some idea of your starting line. I want to highlight one particular dimension of audience knowledge that seems to often be invisible to both creator and audience. This dimension is whether the audience is expecting a procedure that will yield content or expecting fully instantiated content. That is, does your audience expect a monster generator or a monster manual? Reusable tool or catalog of content ready to use? This also corresponds to the parable of teaching a person how to fish or giving a person a fish. More generally, the tension here is between flexibility at the cost of incompleteness and completeness at the cost of builtin assumptions. A tool without a catalog may seem unfinished while a catalog without a tool may seem inflexible or imposing unwanted world-building. An audience will often evaluate your work based only on the dimension they care about. This may seem straightforward at some level but can manifest in subtle ways. For example, what determines whether an audience responds favorably to a freeform magic system? Such a system is generally a set of rules or constraints which players must use to create spell effects during play; this places players of magic-using characters into the role of spell authors. However, many players may just want some spells and would rather avoid being put into the role of spell author, at least for that kind of content in that context. One practical takeaway from this principle is simple. To broaden the utility of a game product, make sure that it is useful for players that want a cooked fish dinner and for players that want manuals for how to go fishing. That is, if your product is a generator, such as a method for creating monsters, take that generator and flesh out a catalog of content. Do some heavy lifting for those that want something off the rack. This will have the side benefit of testing your procedure more than I suspect many tools, at least in DIY land, are actually tested. And, if your product is a catalog—bestiary, spell list, populated dungeon with backstory—think about the principles or sources of inspiration that you used to craft that catalog and create a procedure that can help others create similar content. As a concrete example, my own book, Wonder & Wickedness, is primarily a catalog—spells, sorcerous catastrophes, and enchanted items. Though I do discuss principles briefly, I could probably improve the book by adding more explicit procedures for building spells and so forth. This entry was posted in Speculations on May 11, 2018 by Necropraxis. This a very important point. One of the reasons my Mage: the Awakening campaign wasn’t a success was that while some of my players got the hang of making up spells very quickly, some struggled with it. I think some of the people who didn’t like Yoon-Suin specifically mentioned the procedural nature of the book. The first thing I check in a game (after the main resolution system and character creation) is the GM chapter, specifically looking for procedures (wilderness and dungeon population, treasure placement, random encounter tables, etc. ).